Check boxes on Access forms are used to indicate discrete true/false information such as "is Employee", "is active", "Send Newsletter", etc. As such, they are bound to Yes/No (boolean) fields in the underlying tables, which are displayed as True/False, Yes/No, Checked/Unchecked or -1 (true)/ 0 (false). Occasionally however, users are interested in a third state in addition to true/false values, representing non-commited/don't know/don't care values. For example, in collecting voting information, in addtion to Yes or No votes, the fact that a participant has not voted yet may be important. In such a case, preserving that state as Null is important. Triple-state check boxes are designed for this type of data entry. Access checkboxes by default are two-state (true/false). 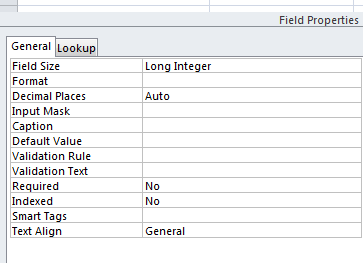 However, there is a triple-state property located under the Data Tab in the checkbox's property sheet (see Figure 1). With the triple-state set to YES, a checkbox can accommodate true/false and NULL data. True appears checked, False appears clear and NULL appears 'grey'. There is one small catch, however. The Yes/No datatype which we typically bind Checkboxes to in Access does not allow NULLs. It is a special case of a numeric data type which only allows 0s and -1's. In Access 2003, you can set the 'Required' property of your Yes/No field to NO - but your triple-state checkbox will still only toggle between true and false, since the underlying field cannot hold NULLs. 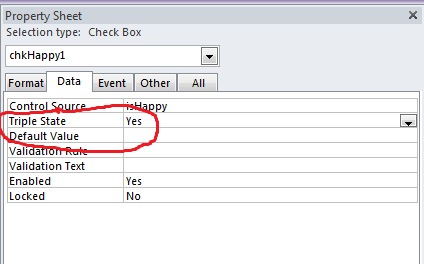 In Access 2010, a triple state checkbox bound to a Yes/No field will simply appear locked. The stored values in the underlying integer field will be -1, 0 and NULL, and the checkbox on your form will display Checked, Clear and Grey - as desired. Figure 3 shows the difference between data typical of a standard checkbox and data from a triple-state checkbox.